Spiders, The Natural Enemy of Security Cameras. AVM can help. One of the most important security camera shots for any business is a face shot. Unfortunately, this often is the most difficult shot to obtain, as criminals will often wear hats or try to hide their faces when entering the building. Your surveillance plan should include a plan to obtain a distinguishable face shot. Entering the building can be difficult due to changing lighting outside, requiring artificial boosting of the image using digital WDR, however if the camera is positioned by the door looking inward, then an excellent face shot can be obtained when perps are exiting the building. Our new line of GANZ HD IP Cameras include several great selections that are popular for providing exactly this critical coverage for your business. Below we will outline just a few of the models and purposes. Our complete line of GANZ HD IP Cameras can be found here. One of the most popular is a hidden style camera, that is concealed inside a normal looking height strip. This camera mounts right on the door frame and conceals a pinhole camera at eye level, providing a great face shot of each customer as they leave your facility, even if they are wearing a hat or hood. This camera is available in several different colors and lens sizes. This new door frame camera model is easily mounted at a height to provide great coverage of persons as they exit your business. Positioning it at a level around 5 feet will provide the best coverage of a person's face, even if they are looking downwards or trying to cover their head. Unlike ceiling mounted cameras, a person will have to walk straight at these cameras to exit the building, assuring that you will alwys have great video coverage to identify persons who have been in your business. 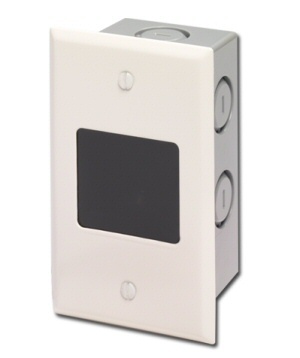 These gang-box in-wall cameras are ideal for situations where you need a face shot and the door frame or height strip cameras are not optimal. These cameras can be positioned at virtually any height and position to deliver face shots of persons inside your facility. 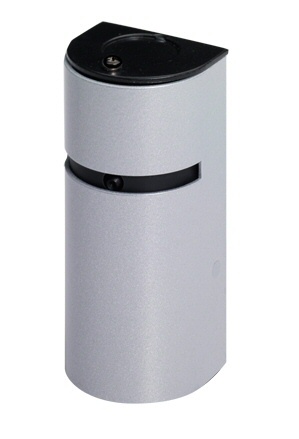 Position this camera at mailboxes, card-access doors, entry doors, or anywhere else you need good facial coverage of the inhabitants. This versatile camera allows you coverage wherever it is needed.